Just4Keepers will be holding our annual Goalkeeper Easter Camps this Easter in DCU Sports Campus (Glasnevin) & Peamount FC. 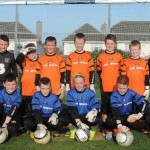 Our Holiday Goalkeeper Camps in Dublin are always packed with In Depth Goalkeeper Training and Goalkeeper Games while all Keepers enjoying Goalkeeper Training. Our Coaches ensure EVERY Goalkeeper goes home happy and having learned more about Goalkeeping.